Weinstein, Muriel Harris. Play, Louis, Play! Illus. by Frank Morrison. New York: Bloomsbury, 2010. 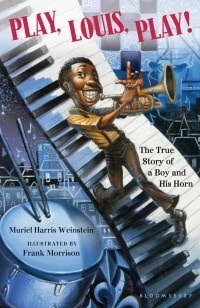 This biography of Louis Armstrong seems to be narrated in a conversational tone by the very first horn he played. Since I also have had a biography of Louis Armstrong published, and this book has been placed in the biography area of libraries by Library of Congress catalogers, naturally I was immediately upset at how it seemed to break some basic rules of writing biographies. With a talking horn, the book seems to be more fiction/ fantasy than real biography -- especially because it also seems as if the author has inserted a lot of made-up conversations and thoughts. However, when I checked the bibliography in the back of the book, I noticed one book that had not been published when I was writing my own biography of Armstrong. It’s possible that the author got these quotes and thoughts from that collection of Armstrong’s words. However, without footnotes, the reader can’t tell what is true from what is made up. I also noticed a few mistakes. For instance -- Armstrong didn’t blow a ‘toy’ horn while working on the Karnofsky’s rag cart. It was a long ‘tin’ horn. A perfectly decent horn used by peddlers and carriages to warn pedestrians that they were coming through. The author is an award winning poet who uses language brilliantly, but I can’t help but wonder if the conversational, jazzy language the horn is supposedly using is anything like that spoken among jazz fans in New Orleans. “Louis’ heart cracked like an old clamshell.” Lovely use of words, but since there aren’t clams in the Gulf, would a New Orleans’ horn use such a simile? Actually the writer overuses similies on every page.